Depressed Monsters Mystery Boxes & more at DesignerCon! Don’t be depressed, sweet child. For it almost time for DesignerCon. Well, for us it’s almost time to fly to LAX. Whilst one half of TTC is sat drinking happy hour beers in Las Vegas, the other half of TTC has a day of travelling to Anaheim today. That doesn’t make us depressed, nope. It makes us thankful & joyful but definitely don’t ask me the same question when I land at LAX in 18hrs time! Enough about us, lets tell you what Depressed Monsters are bringing along with them to DCon this year. In 2018, Depressed Monsters are doing something they’ve never done before and offering you their mini 3inch Yerman as part of their DesignerCon Mystery Box series. There will be Yerman, pins, stickers at least worth up to $30 available in these boxes. With a 1/1 GOLDEN YERMAN being the top prize to find. Each Mystery Box is priced at $20 and will be limited to 60 boxes. You’ll be able to find Depressed Monsters and these DCon Mystery Boxes at booth #216 from Friday night! 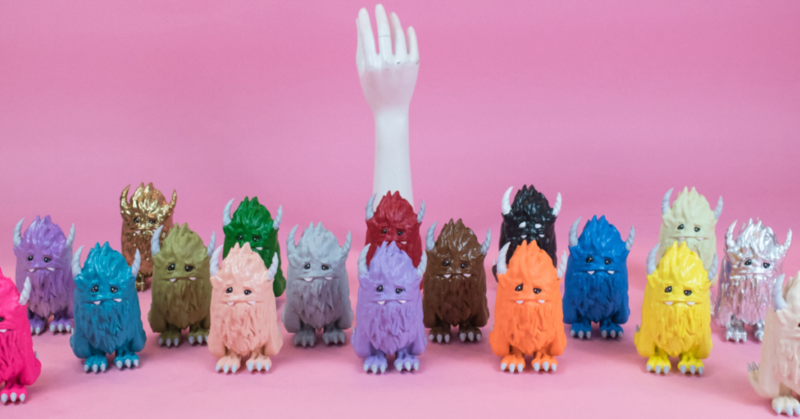 In addition to these mystery boxes, Depressed Monsters will also have 5.5inch Yerman toys limited to 18 pieces. Each toy is hand-painted and there is only one of each colour available at DesignerCon so once that colour sells, it’s gone forever! They are also going to have a Yerman Bazaar which will feature a gallery of 8.5inch Yerman art toys! Each toy is hand-painted and features an original piece of art. They really want to make designer toys unique at their booth and everyone having a chance to pick up an original art piece that nobody else has is something they’re really passionate about! If that’s not all, Depressed Monsters will also have a larger selection of apparel than they have had in years past with some that have been long sold out from their wholesale partners so it may be your last chance to pickup a few of their classic tees they’ve been holding onto! Don’t forget to check out Depressed Monsters on Instagram to get further insight into their DCon booth #216 HERE.